You are currently browsing the category archive for the ‘Dog park’ category. The Bunny Bash includes photos with the Easter Bunny by Warmowski Photography for an additional $15 donation. All funds go to add-ons for the Jacksonville PetSafe Dog Park. Bring your pup(s) and join in the Bark Park Bunny Bash at the Jacksonville PetSafe Dog Park starting 1pm Sunday, April 14th. Easter egg (tennis ball) hunt, prizes, pictures with the Easter Bunny, pet costume contest, and a 50/50 raffle. Find the special ball and receive a prize. $5 donation per pup. Photos with the Easter Bunny sponsored by Warmowski Photography for an additional $15 donation to the Bark Park Initiative of the Jacksonville Park Foundation. Big thanks to Clint from C&A Construction for fitting into the bunny suit. See photos from previous years 2018 • 2017 • 2016. We ask that dogs be kept on their leash during the egg hunt. Off-leash fun within the park will resume afterwards. Proceeds from this event, as well as all our events, will go towards upgrades to the park. The Bark Park Initiative is a committee of the Jacksonville Park Foundation, a 501c3 non-profit. See event on Facebook for more details and updates. Checking tennis ball picked up at Jacksonville PetSafe Dog park at 2018 Bunny Bash. Thanks to BLH Computers, you can recycle your Christmas tree lights and help the Jacksonville Park Foundation! Now through January 14 drop off your old Christmas lights in the box at the entrance to County Market. Any funds raised from the recycling project will go to support our projects including the Bark Park Initiative, Protect the Melon! and the Jacksonville Children’s Community Gardening Initiative. If you have any other electronics (as well as Christmas lights), you may drop them off at BLH Computers at 832 S. Main Street (across the street from Rexx Battery). Hours are 8-6 Monday-Friday and 10-6 Saturday. You can learn what BLH accepts for recycling here. 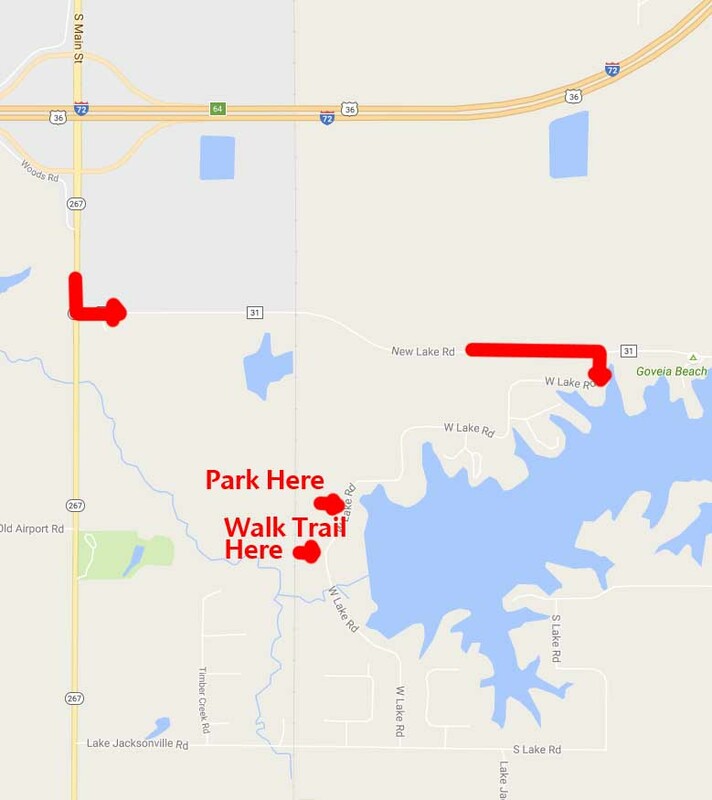 A team of University of Illinois at Urbana-Champaign students and faculty this week kicked off the planning process for a new dog park for Jacksonville, Illinois. Professor Lara Browning from the Office of Recreation and Park Resources will lead a group of students and others in designing the dog park and planning for add-ons. The project will be paid for by $100,000 in grant money as well as any additional funds raised by the Bark Park Initiative of the Jacksonville Park Foundation or contributed to the city. Your input is needed — use the form at the bottom of this post to submit suggestions and ideas for the new dog park. 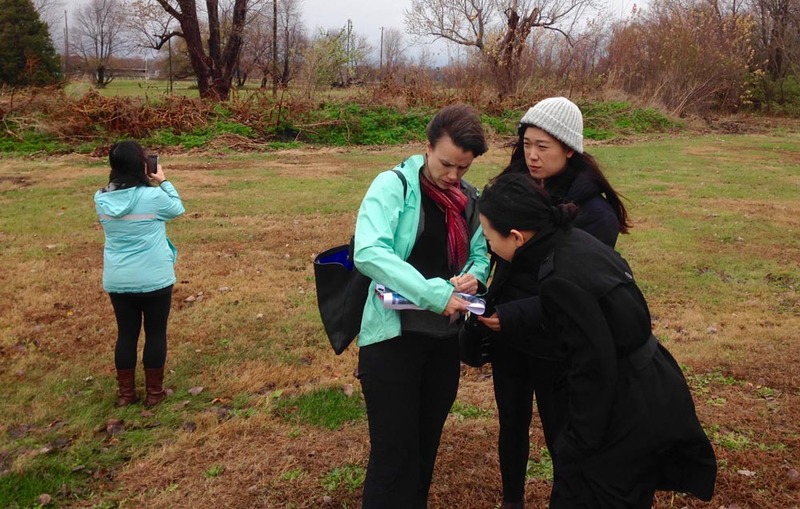 Professor Lara Browning of the University of Illinois’ Office of Recreation and Park Resources takes notes as she leads students on a tour exploring the site of the future dog park in Jacksonville. 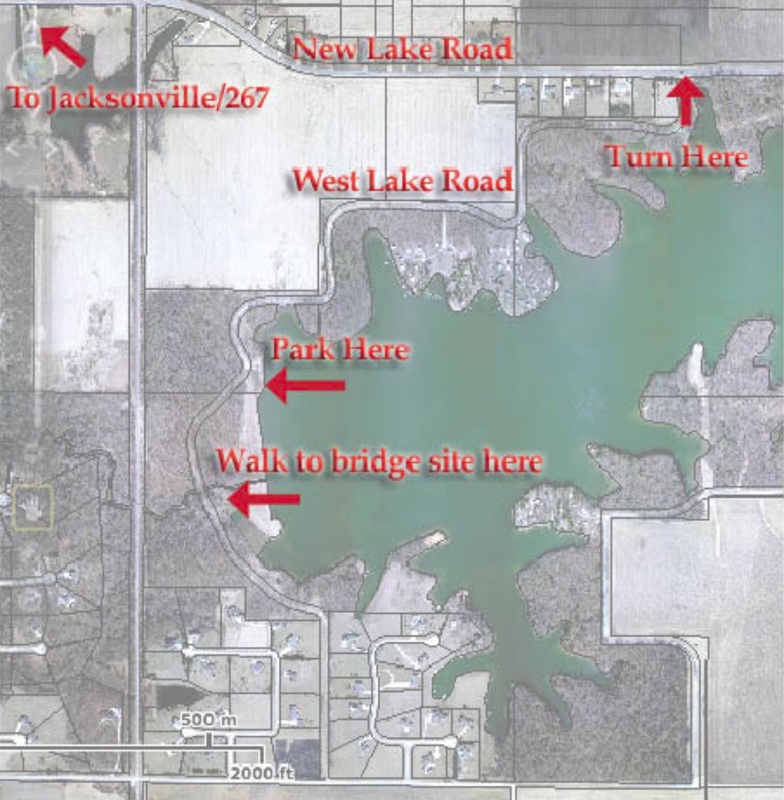 The U of I group started at a meeting of the Jacksonville City Council’s Parks & Lakes Committee, where general outlines and goals of the project were discussed. After the meeting Tuesday November 17, the group went to the future site of the city’s new dog park to get the lay of the land. The student team will collect input from the community, and present the first draft of a plan and designs to the city council (updated — meeting will be 4-6pm Monday February 8, 2016 at City Hall). Link to see the University of Illinois study proposal. The Jacksonville community won $100,000 in the PetSafe Bark for Your Park contest, with 100% of the funds dedicated towards the new dog park. At the Parks & Lakes committee meeting it was estimated the initial grant will pay for basics (fence, parking, water fountain, signs, walkways and meeting accessibility requirements). The park plan will also lay out designs for future add-ons and improvements to be paid for by donations and any grants obtained. Waverly, Iowa won last year’s PetSafe contest and spent $100,000 plus approximately an additional $20,000 to make their own park covering the basics mentioned above. The U of I study will present plans and fundraising goals for additions to the park, with the goal of designing the best dog park appropriate for the community. 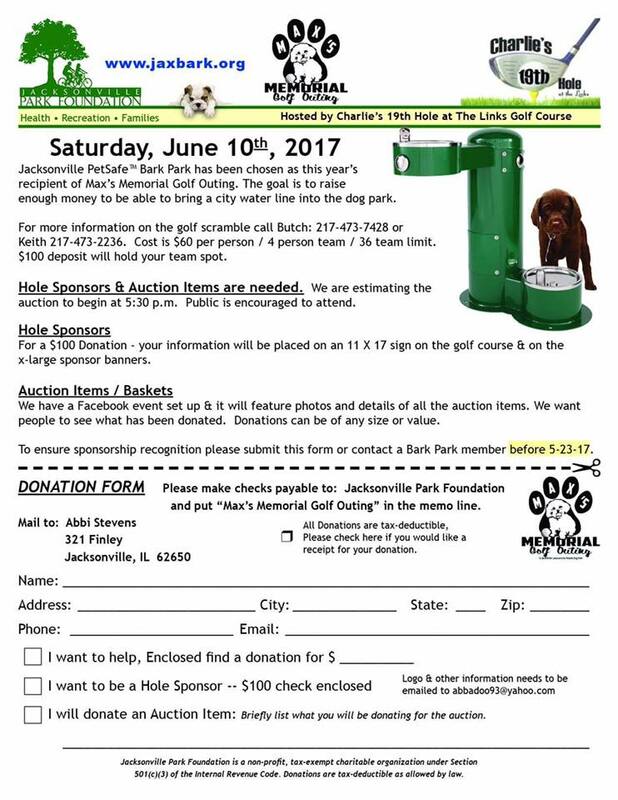 The Jacksonville Park Foundation set up the Bark Park Initiative to raise funds for those add-ons. Follow the committee on Facebook, keep tabs on their events, or make your own contribution to support the effort. Lara Browning is a Landscape Architecture Specialist for the Office of Recreation and Park Resources and has expertise in the planning and design of outdoor recreational spaces, educational and interpretive landscapes, therapeutic gardens, ecological site design, and community-engaged design processes. She previously helped plan and design dog parks at her last position at Virginia Tech. The pubic is invited to submit ideas and suggestions on the project. What have you seen in other dog parks that you like? What features should the dog park have? What are your concerns that could be mitigated in the plan? 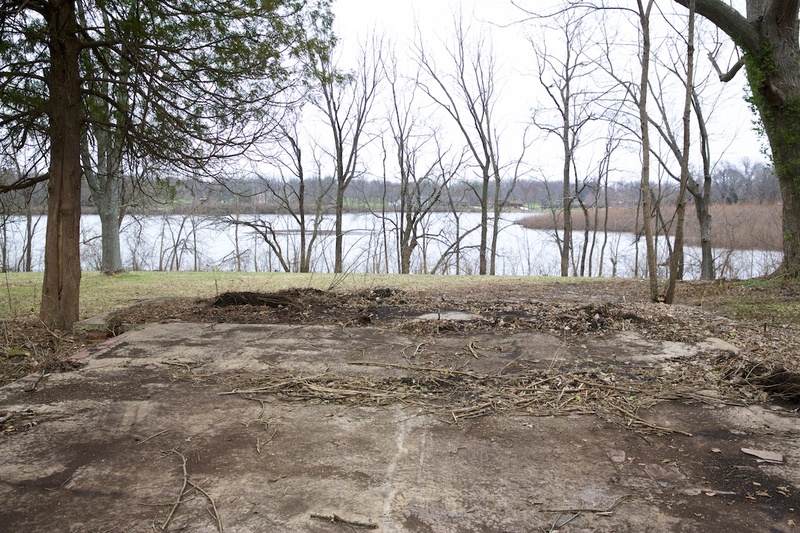 The new dog park will be at the site of the old MacMurray Cabin (old Kiwanis Hut), located on East Vandalia Road across from the east entrance to Nichols Park. 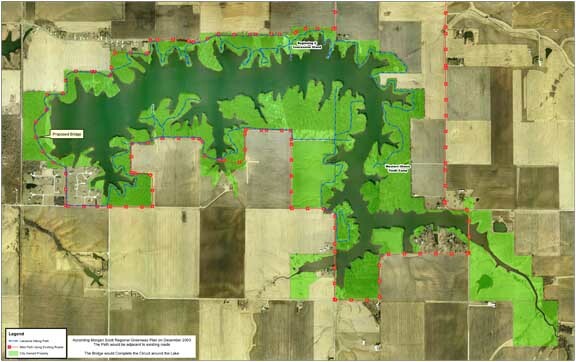 The site is approximately 3 acres with trees, grass and Mauvaisterre Lake shoreline. Once in the park, dogs can be be off-leash to play and socialize. The City of Jacksonville will be hosting a Bark for your Park Community Results Party on the Square, Friday the 31st of July, starting at 1:45pm. Say you’re coming and get updates via the Bark Park announce Facebook event page. 4-6 Music from Horseshoes and Hand Grenades​, food from downtown vendors. What? You have a job?!? Come downtown after work, the party should still be going on. Check Jacksonville Bark for Your Park​ page and the Facebook event page for updates. Celebration sponsored by Mayor Andy Ezard, The Source​, Benton & Associates​, Hamilton’s Catering​, SafeCo Donuts​, The Soap Co. Coffee House​, All Occasions Flowers & Gifts​, Jacksonville Main Street​. NOTE — Similar events are being planned with the sponsor in other towns (they set the time and date). So we won’t know until 7/31 if we won $25,000 or are TOP DOG and get $100,000. Still, you GOTTA BELIEVE the community did it! Come join the celebration! Wednesday July 22nd is the last day to vote for Jacksonville in the Bark for your Park contest. We are having a final daily drawing — a Grand Slam Giveaway for tickets to the Cardinals/Pirates game September 4th. These 3rd base field box tickets go for more than $450! All you have to do is Bark on PetSafe http://bit.ly/1H4FII1 and Bark again on Facebook http://bit.ly/1KmWkhh then go to the contest post on the campaign Facebook page and say when you voted before 11 pm and you’ll be entered in the drawing. 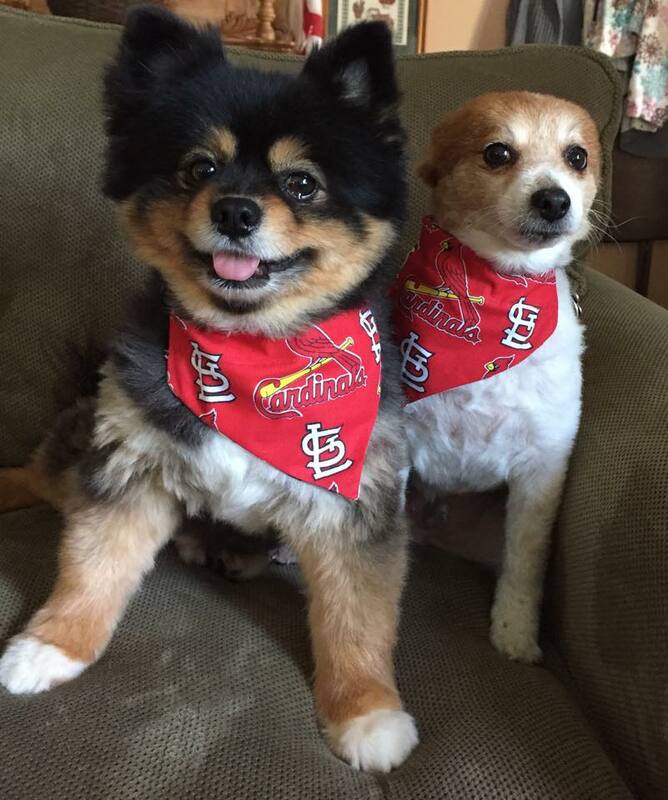 Cardinal fans Zeke and Barley are back again — this time with box seats! The contest is in the Howl at the Moon period where the vote counter is hidden. Your vote still counts, you just can’t see your vote number. Put in the time you voted (or a screenshot) to enter the contest. If you can’t vote twice, please vote once and then enter the drawing. You can only enter our drawing once. Tickets were paid for by folks who purchased t-shirts. Thanks to Paul of Lonergan K9 Academy for wrangling the tickets for us at a great price. See our last post for more details about past drawing sponsors. Thanks to campaigners Stephanie Fernandes and Abbi Stevens (C&A Construction) for managing the daily drawing give-aways. You don’t have to be from Jacksonville to support us. It can take less than half a minute to vote twice (see video). It takes a little longer the first time. It’s easiest to log in using your Facebook account. If you just have email you can still vote at least once. We had a lead the final days going into the contest, but the competition was starting to eat into our cushion. Don’t let the cushion-eating dogs outdo us. On heednesday vote for Jacksonville in the Bark for your Park contest and you might win tickets for the Cardinals/Mets game this Sunday. All you have to do is Bark on PetSafe http://bit.ly/1H4FII1 and Bark again on Facebook http://bit.ly/1KmWkhh then go to the contest post on the campaign Facebook page and say when you voted before 11 pm and you’ll be entered in a drawing for 4 tickets for the game in St. Louis 1:15pm July 19th (Section 189/Row 13). That’s a winner! Note — the contest entered the Howl at the Moon period where the vote counter went dark 11pm Tuesday. Your vote still counts, you just can’t see your vote number. Put in the time you voted (or a screenshot) to enter the contest. If you can’t vote twice, please vote once and then enter the drawing (invite someone to join the pack and provide the missing vote). Jacksonville leads in the contest — but we’re not letting up until the contest ends 11pm local time Wednesday July 22. Some events in this final week of the contest . . . Pack the dog run at Veterans Park, 7 pm Wednesday July 15. Puppy Pastries at SafeCo downtown at 214 S. Main St. Saturday July 18, 5 am until sold out. Final Push Party at Pet Supplies Plus, 11 am – 5 pm Saturday July 18, 1805 W. Morton. Contest ends midnight (eastern) Wednesday July 22. Cardinals tickets were paid for by Jacksonville Bark for Your Park campaigners. Thanks to the businesses and other supporters who gave prizes for our Daily Drawings . . .